All it takes is one trip to the club for Atlanta to go from being a fish-out-of-his-depth story to a fish-out-of-water story. Earn has always looked misplaced in his new hip hop milieu, owing to the fact that he presents himself like a nerdcore rapper rather than adopting a new look or a new way to show up when he walks into a space. But he’s never looked more out of place than in “The Club,” which finds Earn accompanying Alfred to an underwhelming club appearance and spending the night in pursuit of Chris (Lucius Baston), the establishment’s shady owner. No one wants to be at the club less than Earn—he hates shots, for God’s sake—but this is part of the career he’s chosen. Seems as good a time as any to ask what draws Earnest to this type of work beyond his proximity to Alfred and his desire to provide a better life for Van and Lottie. What did he have in mind when he lobbied so aggressively for this gig? What did he expect it to be like? It’s clear that when Earn signed up to manage Paper Boi, he didn’t expect to spend an evening chasing down a slippery club manager who winds up arbitrarily slashing Paper Boi’s pay from five stacks all the way down to $750. Maybe he was expecting smooth, pleasant business transactions and for Paper Boi to have a career trajectory that yields overnight riches. Instead, Earn is stuck tailing Chris across the dance floor, into the bathroom, and finally into the back offices through a secret door straight out of Scooby-Doo. When Earn finally locates Chris, he does a Cosmo Kramer pratfall into the office, then spits up his brown liquor like a spiteful baby. Neither gesture puts him in an advantageous negotiating position, so Earn winds up shuffling away in defeat when Chris steps to him. By this time, Alfred has already had a dull, humiliating night at the club. The D.J. announces the presence of the one-and-only Paper Boi to tepid applause. His V.I.P. section is woefully underpopulated because he’s come on the same night as Marcus Miles, a flashy pro baller with an invisible car and cash to burn. Marcus has the fame and wherewithal to draw any beautiful woman into his orbit, and despite their best efforts, Alfred and Darius can’t compete. As a result, they’re stuck looking like supporters of the last-place candidate at the sexiest, most bootylicious caucus in American history. The only attention Alfred gets is from his male fans, who quote his lyrics a little too enthusiastically and turn his V.I.P. section into Oktoberfest. Finally, Alfred wins the attention of a dimepiece, but gets rebuffed when she says she has a boyfriend, and that by hanging out with him and making him feel like a king among men, she’s held up her end of the social contract. The final insult comes as Earn confesses to getting punked by Chris, and Alfred refuses to accept it. He storms into the back office and yokes Chris up until they get the money and a few cases of beer for the road. Later, as Earn, Darius, and Alfred debrief at Waffle House, they see a news report mentioning the parking lot shooting during the let-out and Paper Boi’s involvement in an armed robbery at the club. 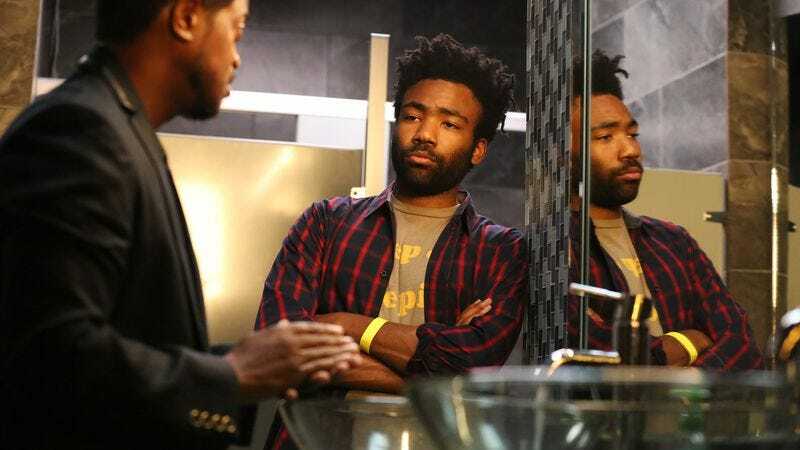 The last scene technically qualifies as a cliffhanger, but the consequence of the show’s extreme versatility is that Donald Glover has taught the audience not to expect anything in particular from Atlanta from one episode to the next. Characters will show up and disappear without notice, and there’s always the possibility of a complete format departure as in “B.A.N.” At this point, it seems like Atlanta is best enjoyed as an episodic anthology about the same loose ensemble of characters. But the show continues to operate, at times, like a more traditionally told story even as it maintains an abject disregard for such conventions. As an episode of a loosely structured anthology, “The Club” is another terrific installment in an excellent, exhilarating debut season. Darius, who I’ve missed dearly, is back in fine form and Brian Tyree Henry turns in yet another terrific performance. He’s as good at playing abject frustration as anyone outside the cast of Veep. The single setting lends the episode a sense of structure, but it’s ultimately like the rest of Atlanta’s episodes, a candy bowl full of hilarious, absurd, keenly observed moments. But I’m curious to find out how people felt watching “The Club” after “B.A.N.”, because I’d imagine the transition from that episode to this one was bumpy whether you loved that episode, hated it, or somewhere in between. The episode returns Atlanta to its singular role of presenting superheavy concepts with a light tone. (I suppose “B.A.N.” counts too, but it was a little too clever to land as satire.) As was the case with the pilot and with “Go For Broke,” “The Club” is another example of how the show injects humanity into a hip hop headline cliche. When there are stories in the news about rappers involved in violence or criminal activity, there’s a tendency to dismiss each instance as further proof of a morally bankrupt subculture. But every Gucci Mane, every Lil Boosie, and every Bobby Shmurda is the star of his own movie. Maybe if we saw the run up to the fateful events that ensnared them in the justice system, we would have as much empathy as we have for Alfred. Maybe when someone is repeatedly affirmed for looking scary and intimidating, it’s unreasonable to be upset when they capitalize on that. At the end of the day, everybody just wants to be treated like a very important person. Darius is a pretty good dancer, yo. He also asks provocative questions like “Who bounces the bouncer?” I’d buy him free drinks too. Hiro Murai is back on directorial duty this week after ceding the responsibilities to Donald Glover. The callback to the invisible car was amazing. But I’m still not clear: who was driving it? If it wasn’t Marcus Miles, did someone steal an invisible car?